He, of course, was talking about me. As his words washed over me, I sat frozen in shame. The boy’s inquiry was especially horrifying to me as he had been in my fifth grade class, but here he sat pretending like he didn’t know me. My best friend stumbled around with a defense. But as a few more incidents like that happened, and she skyrocketed to the top of our junior high social infrastructure, our friendship began to dissolve. By the time we reached high school, the only time I ever went over to her house was when her mom asked me to babysit her younger brother. Obviously, that was middle school, but the reality is that rejection is not isolated to the middle school setting. And those rejections that happen to us — even from a long time ago — can have real and lasting impacts on our sense of worth. However, the truth is that at times we will get the boot in a relationship or a pink slip at a job. There will be times that we don’t measure up to the standards of others or fail in our execution of duties. Yet, if we let our hurt and anger turn to bitterness in the course of the rejection, we will find ourselves enslaved to out-of-control emotions that destroy our future relationships and opportunities. 1. View rejection as protection. In a recent article, Lysa Terkeurst writes that there is “usually some element of protection wrapped in every rejection.” I never thought about it like that until I read her statement, but her words are true. While most of us do everything we can to be in a certain group, there are times when God may lead us away from a particular relationship or opportunity because He is protecting us. In the case of the middle school scenario I described, the rejection felt unbearable at the time because I wanted to be liked by his group of kids. They were popular — and my best friend from my neighborhood, the one whom I had invited to attend public school with me (she was a former private school attendee), was someone I desperately wanted to impress. I can’t tell you how humiliating it was for me to be shamed in front of her by kids I had grown up with. However, rejection from that particular group was actually a good thing for me. They were a fast group of kids who ended up doing a fair share of partying, bent on wordly pursuits. Because I was blindly pursuing inclusion in this particular group, I could not see that God had given me friends that were more my pace. While I wasn’t as thrilled about the bookish girls at the table I usually sat at, I had much more in common with them. They liked to read books and involved themselves in activities like student government and yearbook. Instead of looking for a grander friend base (when it clearly wasn’t working out), I needed to recognize God’s protection steering me away from influences that weren’t good for me. 2. Everyone experiences rejection: what matters is how we deal with it. 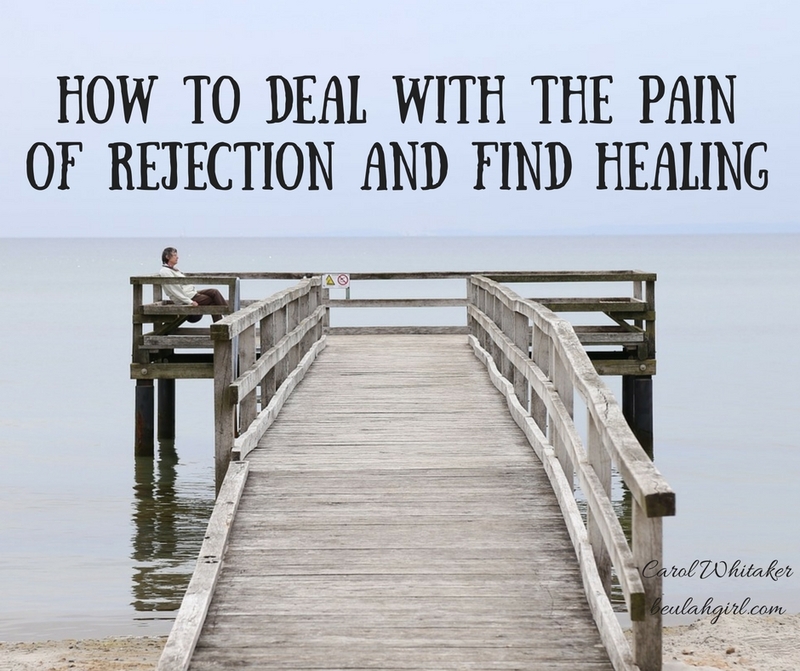 For those of us who have experienced a lot of rejection, we may think we are the only ones. Perhaps we have developed an unhealthy dialogue in our head that goes something like this: This always happens to me. I am always the one who gets left out. However, the truth is that everyone, at some point, experiences rejection. Whether that be by a spouse, a friend, a parent, a boss, a co-worker, or a sibling. What matters is how we react — what thoughts we allow in our heads as a result of our rejections. In his article “How to Cope With Rejection,” Dr. Frederic Neuman notes as a psychiatrist he had one self-confident patient who didn’t have much going for him in the looks department, yet he managed to never have a shortage of girlfriends. Conversely, he had a fellow psychiatrist who by all appearances had everything going for him, yet had terrible anxiety (after the breakup of his marriage) about dating women. What was the difference? When meeting women in a social setting, the patient usually was rejected by several prospective women in a night before he would meet one who would talk to him. He just shrugged off the rejections and kept moving. The psychiatrist, on the other hand, was paralyzed and defeated after his divorce to the point that he was afraid to put himself out there. If we have numerous rejections or a traumatic experience that rocks our sense of worth, we may be more susceptible to rejection. While our more stable peers may brush off the slights and jeers they receive — we may internalize them and believe everything negative we hear about ourselves. The key is to know what God says about us and, as the pastor at the new church I have been attending says, preach the truth to ourselves every day. What does God say? We are loved. We are treasured. He delights in us. He formed us in our mother’s womb. He knew us before we were born. His version of us needs to be the filter we use to accept or not accept the words and actions that come our way. 3. Past rejection shouldn’t define our relationships in the present. Beth Moore makes an adept observation in a recent Proverbs 31 Ministries devotional that the biggest obstacle we have to our next relationship may well be a previous one. Recently, I had a situation where I dreaded a certain conversation I needed to have with an individual. I had offered some candid comments, and because my honesty had at times in the past caused people to cut off relationships with me, I was sweating this person’s response to me. However, the person surprised me by not reacting in anger but rather thanking me for my honesty. We were able to have a good conversation after that, and I appreciated the person’s ability not to take offense at my words. My fear over the reaction I anticipated was unfounded. I assumed that the reaction would be one that others had to me, but I found that not to be the case. As Moore stresses, just because we have been rejected in a past instance does not mean that we will be rejected in a future one. In fact, according to Moore, the very next person we meet may be the most key person to us on our journey. Therefore, we can’t let what has happened in a few relationships ruin or define the new relationships God wants to send our way. Rejection is not easy. No one wants to have a middle school type moment and be the one no one talks to or invites to the party. But we should know that rejection is something that we will all experience. Rather than avoid new relationships or people altogether, we need to work through our rejection, forgive those who have hurt us, ask God to forgive us where we have held any grudges — and keep walking with open hearts knowing that rejection in one’s past doesn’t have to ruin the good God has for us in our future.